I thought it would be fun to share a little twist on the traditional outfit or makeup post and do a little behind-the-scenes on getting ready for a glam night out. Whether it's date night with the hubby or prepping for a huge production like the Oscars, all of us like to put a bit of extra effort in looking dazzling for that glamorous event so it's important to check off every detail. Before each special event I try to think ahead and prep beforehand starting with exfoliating my face and lips for a smooth makeup application. 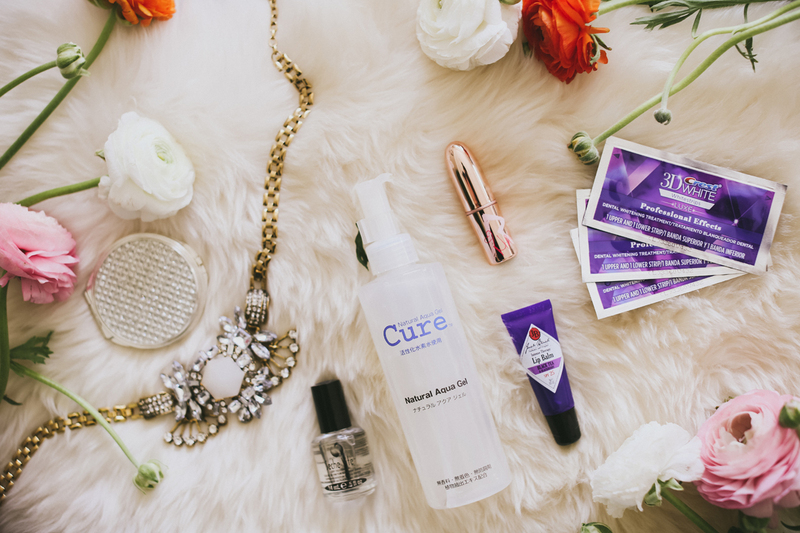 I'm obsessed with Cure Aqua Gel, my long-time gentle exfoliator love and slather my lips with Jack Black Intense Therapy Lip Balm since it goes on more matte and is great to use before applying bright lipstick. To making sure my nails are on point I'll patch any chips and add an extra coat of Seche Vite. This is especially handy if I don't want to completely re-do an entire manicure since chips are not acceptable on both red carpets and dance floors. Last but not least I like to keep my teeth looking photo-ready with the help of Crest 3D White Luxe Whitestrips Professional Effects. Even with all of the sequins and hairspray, there is nothing better than someone complimenting you on a nice smile, right? I kind of like to think of it as my James Bond secret weapon. Pew-pew! Instead of a shoe sole-cell phone-gun, I will knock you out with my radiant teeth. (Anyone else have an obsession with REALLY white teeth? Just me? Bueller?) Follow along with me on Twitter, Facebook, and Instagram to see my red carpet evening on Oscars night this Sunday and share your best #SmileStyle getting-ready tips with @StyleList and @3DWhite! Thank you so much to the ever-amazing Kassia Phoy for capturing my behind-the-scenes fun! To see more ladies getting ready for their glam nights check out the StyleList Gallery. Readers, what is your secret to prepping for a big night out? Let me know in the comments below! Disclaimer: This is a collaboration between Crest and the AOL Lifestyle Contributor Network. Compensation was provided by Crest via AOL Media. The opinions expressed herein are those of the author and are not indicative of the opinions or positions of Crest. Love this sparkling dress! It's a gem, literally! Everything is kept quite simple, and the black tones down the dress, but the nails make quite the statement accessory! Stunning! love this look! I've never heard of the cure gel, is it straight up a gel or are there beads in it? No beads in it, it's just a very liquidy gel which makes your actual skin bead up and slough off. LOVE it since it's gentle & so effective! You look gorgeous. That dress is absolutely beautiful and your makeup is so pretty! O X A N A M.U.A Makeup Blog NEW SMOKIN HOT POST! You're so beautiful! Love the dress! I really love your look!! It is so great! You are so beautiful. And your nails are fantastic! You look so amazing Jen! The sequin dress is perfect on you! Love the last photo! Picture perfect moment with that smile!! love your last photo..you look beautiful !! I just wondering, isn't using teeth whitening gonna damage your teeth? You look so gorgeous! Your sequin dress is so pretty. I love to exfoliate before a big event too! Lips and face! ^_^ I also like to shave/epilate pretty much everything the night before lol (face, underarms, arms, legs.) haha obsession with being hairless! ^^;; I also like to do my nails the night before too. Sometimes depending on the event, I'll use deep treatments in my hair so it's ready to style and easier to work with! Great post!!! I loooove your dress it's gorgeous and looks great on you! the dress is gorgeous, where is it from? Make Up For Ever Full Cover Concealer! I'm getting ready to whiten my teeth for a wedding. I saw your video where you recommended the Dial-a-Smile system. If you had to choose one, would you recommend the Dial-a-Smile or the Crest 3D White Strips? Thanks! Love your blog! You look so amazingly gorgeous Jenn. Everything is perfect, from you nails to your outfit to your makeup and hair. Your lashes are perfect. What brand are they? can you tell us where you got the dress? it's gorgeous! thanks Jen! how are you liking the MUFE mat velvet foundation? does it break you out? i just recently start using it and i am not sure if it is the reason for my break outs. Hi! I just watched your sensitive skin video and then read this blog post by chance. Now I am obsessed with finding Cure Aqua Gel! Where do you get it from? I'm slowly searching all my local Japanese grocery stores, but haven't found it yet. Jen, I really like this Behind-the-scene post. Its really nice to hear about your experience and getting ready for any special occasion. Definitely do these more often if possible. I seriously need to get myself some Crest 3D Professional Effect. I am graduating from college soon, and I would like to look my best. :) Thanks! Wow, you look stunning Jen! And you rock that dress! Lovely post! You and I seem to be the same size! It's so hard to find pretty dresses in my size! I was wondering.. what size did you purchase the dress in?? ?